"" The Preppy Strawberry: A sneak peek at what’s coming up this week…..
A sneak peek at what’s coming up this week…..
Christmas Pinterest Party – Ever host a pinterest or GNO (Girls Night Out) craft night? 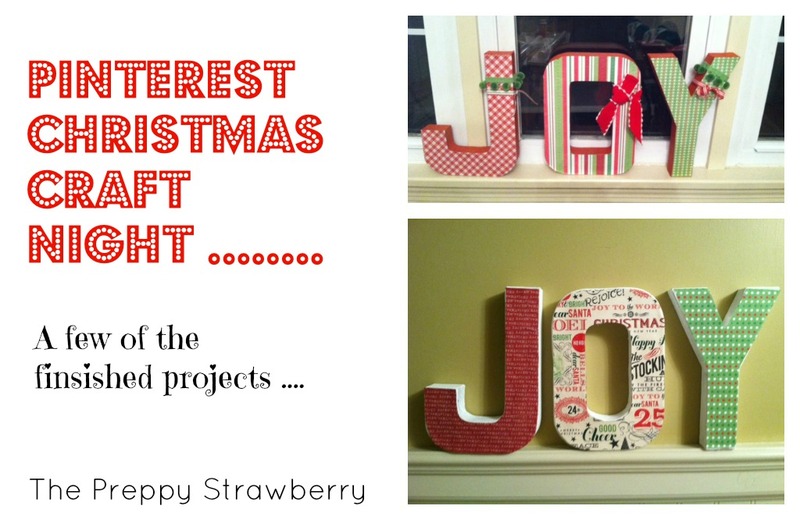 I just hosted a Christmas craft night here’s a peek at the project we worked on and this month we invited our girls to join us! Community Christmas Tree post – we just made animal friendly ornaments for a community tree at the park. I’ll post all the details about what we made for our tree! The event got canceled this year but Lilly and I headed over today and hung up some of the ornaments her troop made. First Grade Christmas Project – A little Christmas craft I worked on with Lilly’s class today. Each student got to “Elf themselves” such a fun project and they all turned out super cute! I can’t wait to see them hanging up in the hall! First Grade home work this week…. Decorate your Gingerbread to make him or her too sweet to eat! Follow me on Facebook so you don’t miss an update ….. just saying you might want to stay tuned this week! love the elf project that you did with lilly's class... SO cute! bet the kids had a great time with that :) very creative!